The tour will start in BOXTEL (The Netherlands). Admission is to all Volvos but especially to T-5R's. The admission fee will be 20 euro per car. This will allow you a tour shield (for on your car) and a tour book (directions). Will you participate in the tour on Sunday? Numer of persons in the Volvo? Your registration guarantees a Tourshield and Tourbook. A Grill / BBQ will be organized after the tour in Boxtel (the Netherlands). The cost is 25 euro per person, due at the bar of the restaurant. Included are meat, bread, salads and sauces. Drinks are not included. Your reservation is required before the 2nd of June 2019. Will you join us at the Grill/BBQ on Sunday afternoon? Line-ups of T-5Rs will be formed on the main field of AquaBest in Best (the Netherlands) on Monday morning early. We’ll expert a record attendance of T-5Rs! Please supply information about your car beforehand so that we can create a list to allow proper line-ups to be formed. T-5Rs will be directed to the main field at the gate entrance. Please follow instructions. Entrance fee per car to the area will be 5 euro, to be paid upon entering to the organizer of the Volvodrive event. If you don't have a T-5R you don't need to register here. Will you take part in the line-up on Monday with your T-5R? 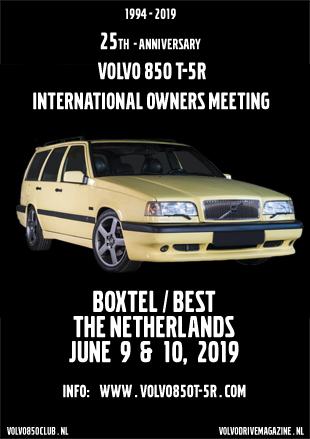 For dutch T-5Rs: If your car has been suspended ('geschorst') you can use the tax event arrangement ('evenementenregeling') of the VolvoDrive meeting ( https://www.facebook.com/volvodrivetreffen/ ).